CRISPR/Cas, comprised of Clustered regularly interspaced short palindromic repeats (CRISPR) and associated proteins (Cas), provides adaptive immunity against foreign DNA in bacteria and archaea. Type II CRISPR/Cas9 has attracted considerable interest as a tool to probe and manipulate biological systems. It has been engineered to introduce genome editing in a simple, flexible, and efficient manner. Various approaches have been explored to reduce the off-target effects, which limit its applications in certain circumstances. Moreover, a catalytically inactive Cas9 was used to guide various effectors and a labeling agent to specific DNA targets through protein fusion, thus enabling genetic/epigenetic regulation and visualizing specific genomic loci in living cells. Further, CRISPR/Cas9 could have a significant impact on medicine by facilitating the generation of cell lines and animal models for therapeutic screening and evaluation, and by providing a new promising avenue for gene therapy. CRISPR/Cas9 technologies are being rapidly developed in multiple directions, enabling new approaches for biological research. In addition, they may transform how drugs are developed and how human patients are treated in the future. 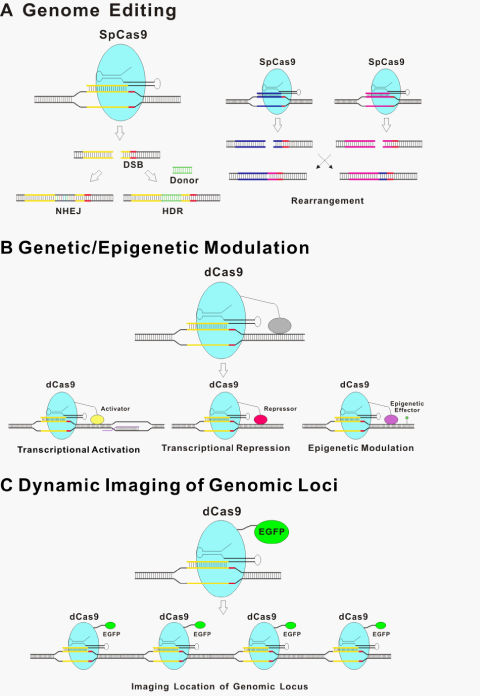 Here we review CRISPR/Cas9 technologies originated, their applications utilizing the natural function, expansion of applications by repurposing to other functions, efforts for precision improvement, and finally how CRISPR/Cas9 may impact medicine. The CRISPR/Cas system is immune defense machinery in bacteria and archaea that utilizes short RNAs to direct degradation of invading foreign nucleic acids, such as those from viruses or plasmids.1–3 This system essentially contains clustered regularly interspaced short palindromic repeats (CRISPRs) and their associated genes (Cas).2,4–7 CRISPR locus contains a series of short repeated sequences that are separated by non-repetitive spacer sequences derived from foreign genetic elements (Figure 1). This conserved repeat-spacer-repeat architecture was originally observed in the Escherichia coli genome in 1987.8 It was later found that the spacer sequences in CRISPR loci are identical to sequences in bacteriophage (phage) genomes and plasmids in 2005.9–11 More than 40 different Cas proteins have been reported so far.12 Based on the sequences and structures of Cas protein, CRISPR/Cas system is primarily classified into three types I, II and III.6 In CRISPR/Cas system, invading foreign DNA is processed by Cas nuclease into small DNA fragments, which are then incorporated into CRISPR locus of host genomes as the spacers. In response to repeat viral / phage infections, the spacers are used as transcriptional templates for producing CRISPR RNA (crRNA), which guides Cas to target and cleave DNA sequences of invading viruses and phages13 (Figure 1). A unique feature of Class II is that a single Cas protein performs multiple functions whereas in other classes multiple Cas proteins are required to orchestrate and fulfill the role.13–16 Such simplicity makes it an ideal system as a biomedical research tool. Figure 1 Mechanisms of CRISPR/Cas9 mediated bacterial immune-defense. Phase 1: Immunization process: the CRISPR locus contains a series of short repeated sequences that are separated by non-repetitive spacer sequences derived from foreign genetic elements. Invading foreign DNA from viruses and phages is processed by Cas nuclease into small DNA fragments, which are then incorporated into the CRISPR locus of host genomes as new spacers. Phase 2: Immunity process: In response to viruses and phage infections, the CRISPR repeat-spacer array is transcribed into a pre-crRNA and processed into mature crRNAs, which guide Cas to cleave foreign DNA. High specificity in the context of a genomic scale, ideally unique occurrence in the genome, needs to be achieved for precision in targeting. Most nucleases do not bind sequences that are long enough to reach high enough specificity, except a class named meganucleases. Therefore, meganucleases were engineered to facilitate genome editing via cutting DNA in a highly specific and targeted manner.25–27 Fusion constructs of non-specific nuclease and repetitive domains that confer DNA recognition specificity, including zinc fingers (ZF) and transcription activator-like effectors (TALE), have been developed and used in genome engineering.21 For example, the CCR5 gene was modified by a zinc-finger nuclease (ZFN) in CD4 T cells of human AIDS patients, which are then infused autologously to decrease the level of HIV infection.28 While all these are protein-based systems, which require significant effort in assembling the constructs, CRISPR/Cas9 system is simpler, more flexible, effective and confers DNA recognition specificity by RNA (Table 1). Figure 2 Overview of CRISPR/Cas9 applications. (A) Genome editing: CRISPR/Cas9 is used to generate double strand breaks (DSB) at specific sites. The introduced DSBs are repaired by either non-homologous end-joining (NHEJ) or homology-directed repair (HDR) (the cartoon on the left). Efficient rearrangement over a long distance in the genome can also be promoted between pairs of targeted loci (the cartoon on the right). (B) Genetic/epigenetic modulation: a transcriptional activation domain or a transcriptional repres­sion domain fused with a catalytically inactive Cas9, dCas9, implements precise and stable transcriptional control of target genes. Epigenetic effectors fused with dCas9 could alter epigenetic states of the target loci, such as histone modifications or DNA methylation. (C) dCas9 was fused with a fluorescent protein (Enhanced Green Fluorescent Protein, EGFP) to visualize specific genome loci in live cells. Recently, several laboratories reported that epigenetic modifications of DNA and chromatin can be introduced via fusing epigenetic effectors with TAL repeats.70,74,75 A dCas9 fusion might also be used to perform targeted ‘epigenetic modulation’. Such targeted perturbation of the epigenetic status of specific loci would allow, for the first time, functional dissection of causative events among candidates found in association studies. d Cas9 fused with a fluorescent protein have been used to visualize specific genome loci in live cells (Figure 2C).76 The movements of telomeres labeled by dCas9::GFP or TRF1, a major telomere-binding protein, were characterized. No significant difference was observed between these two labeling methods, thus supporting dCas9 as a neutral probe of genomic DNA. This labeling strategy, among others, provides a useful tool for studying chromosome dynamics and structure and further extends dCas9-based applications. Given the tremendous value of CRISPR/Cas9 as a versatile tool to modulate various aspects of biological systems, it may provide equally exciting opportunities in clinical applications in addition to those in basic biological research. Work in Y.W.’s laboratory is supported by the National Basic Research Program of China (Grant No. 2014CB964900) and funding from the Chinese Academy of Sciences. Bhaya D, Davison M, Barrangou R. CRISPR–Cas systems in bacteria and archaea: versatile small RNAs for adaptive defense and regulation. Annu Rev Genet. 2011;45:273–297. Wiedenheft B, Sternberg SH, Doudna JA. RNA–guided genetic silencing systems in bacteria and archaea. Nature. 2012;482(7385):331–338. Horvath P, Barrangou R. CRISPR/Cas, the immune system of bacteria and archaea. Science. 2010;327(5962):167–170. Fineran PC, Charpentier E. Memory of viral infections by CRISPR–Cas adaptive immune systems: acquisition of new information. Virology. 2012;434(2):202–209. Marraffini LA, Sontheimer EJ. CRISPR interference: RNA–directed adaptive immunity in bacteria and archaea. Nat Rev Genet. 2010;11(3):181–190. Makarova KS, Haft DH, Barrangou R, et al. Evolution and classification of the CRISPR–Cas systems. Nat Rev Microbiol. 2011;9(6):467–477. Sorek R, Lawrence CM, Wiedenheft B. CRISPR–mediated adaptive immune systems in bacteria and archaea. Annu Rev Biochem. 2013;82:237–266. Ishino Y, Shinagawa H, Makino K, et al. Nucleotide sequence of the iap gene responsible for alkaline phosphatase isozyme conversion in Escherichia coli, and identification of the gene product. J Bacteriol. 1987;169(12):5429–5433. Bolotin A, Quinquis B, Sorokin A, et al. Clustered regularly interspaced short palindrome repeats (CRISPRs) have spacers of extrachromosomal origin. Microbiology. 2005;151(Pt 8):2551–2561. Mojica FJ, Diez–Villasenor C, Garcia–Martinez J, et al. Intervening sequences of regularly spaced prokaryotic repeats derive from foreign genetic elements. J Mol Evol. 2005;60(2):174–182. Pourcel C, Salvignol G, Vergnaud G. CRISPR elements in Yersinia pestis acquire new repeats by preferential uptake of bacteriophage DNA and provide additional tools for evolutionary studies. Microbiology. 2005;151(Pt 3):653–663. Haft DH, Selengut J, Mongodin EF, et al. A guild of 45 CRISPR–associated (Cas) protein families and multiple CRISPR/Cas subtypes exist in prokaryotic genomes. PLoS Comput Biol. 2005;1(6):e60. Zhang F, Wen Y, Guo X. CRISPR/Cas9 for genome editing: progress implications and challenges. Hum Mol Genet. 2014;23(R1):R40–R46. Jinek M, Chylinski K, Fonfara I, et al. A programmable dual–RNA–guided DNA endonuclease in adaptive bacterial immunity. Science. 2012;337(6096):816–821. Garneau JE, Dupuis ME, Villion M, et al. The CRISPR/Cas bacterial immune system cleaves bacteriophage and plasmid DNA. Nature. 2010;468(7320):67–71. Sapranauskas R, Gasiunas G, Fremaux C, et al. The Streptococcus thermophilus CRISPR/Cas system provides immunity in Escherichia coli. Nucleic Acids Res. 2011;39(21):9275–9282. Mali P, Esvelt KM, Church GM. Cas9 as a versatile tool for engineering biology. Nat Methods. 2013;10(10):957–963. Marraffini LA, Sontheimer EJ. Self versus non–self discrimination during CRISPR RNA–directed immunity. Nature. 2010;463(7280):568–571. Sashital DG, Wiedenheft B, Doudna JA. Mechanism of foreign DNA selection in a bacterial adaptive immune system. Mol Cell. 2012;46(5):606–615. Deltcheva E, Chylinski K, Sharma CM, et al. CRISPR RNA maturation by trans–encoded small RNA and host factor RNase III. Nature. 2011;471(7340):602–607. Sander JD, Joung JK. CRISPR–Cas systems for editing regulating and targeting genomes. Nat Biotechnol. 2014;32(4):347–355. Johnson RD, Jasin M. Double–strand–break–induced homologous recombination in mammalian cells. Biochem Soc Trans. 2001;29(Pt2):196–201. Sonoda E, Hochegger H, Saberi A, et al. Differential usage of non–homologous end–joining and homologous recombination in double strand break repair. DNA Repair (Amst). 2006;5(9–10):1021–1029. Rosen LE, Morrison HA, Masri S, et al. Homing endonuclease I–CreI derivatives with novel DNA target specificities. Nucleic Acids Res. 2006;34(17):4791–4800. Arnould S, Chames P, Perez C, et al. Engineering of large numbers of highly specific homing endonucleases that induce recombination on novel DNA targets. J Mol Biol. 2006;355(3):443–458. Smith J, Grizot S, Arnould S, et al. A combinatorial approach to create artificial homing endonucleases cleaving chosen sequences. Nucleic Acids Res. 2006;34(22):e149. Tebas P, Stein D, Tang WW, et al. Gene editing of CCR5 in autologous CD4 T cells of persons infected with HIV. N Engl J Med. 2014;370(10):901–910. Lieber MR, Gu J, Lu H, et al. Nonhomologous DNA end joining (NHEJ) and chromosomal translocations in humans. Subcell Biochem. 2010;50:279–296. Heyer WD, Ehmsen KT, Liu J. Regulation of homologous recombination in eukaryotes. Annu Rev Genet. 2010;44:113–139. Wilkinson R, Wiedenheft B. A CRISPR method for genome engineering. F1000Prime Rep. 2014;6:3. Choi PS, Meyerson M. Targeted genomic rearrangements using CRISPR/Cas technology. Nat Commun. 2014;5:3728. Jiang W, Bikard D, Cox D, et al. RNA–guided editing of bacterial genomes using CRISPR–Cas systems. Nat Biotechnol. 2013;31(3):233–239. Mali P, Yang L, Esvelt KM, et al. RNA–guided human genome engineering via Cas9. Science. 2013;339(6121):823–826. Cong L, Ran FA, Cox D, et al. Multiplex genome engineering using CRISPR/Cas systems. Science. 2013;339(6121):819–823. Jinek M, East A, Cheng A, et al. RNA–programmed genome editing in human cells. Elife. 2013;2:e00471. Cho SW, Kim S, Kim JM, et al. Targeted genome engineering in human cells with the Cas9 RNA–guided endonuclease. Nat Biotechnol. 2013;31(3):230–232. Wang H, Yang H, Shivalila CS, et al. One–step generation of mice carrying mutations in multiple genes by CRISPR/Cas–mediated genome engineering. Cell. 2013;153(4):910–918. Shen B, Zhang J, Wu H, et al. Generation of gene–modified mice via Cas9/RNA–mediated gene targeting. Cell Res. 2013;23(5):720–723. Li D, Qiu Z, Shao Y, et al. Heritable gene targeting in the mouse and rat using a CRISPR–Cas system. Nat Biotechnol. 2013;31(8):681–683. Niu Y, Shen B, Cui Y, et al. Generation of gene–modified cynomolgus monkey via Cas9/RNA–mediated gene targeting in one–cell embryos. Cell. 2014;156(4):836–843. Yin H, Xue W, Chen S, Bogorad RL, Benedetti E, et al. Genome editing with Cas9 in adult mice corrects a disease mutation and phenotype. Nat Biotechnol. 2014;32(6):551–553. Hwang WY, Fu Y, Reyon D, et al. Efficient genome editing in zebrafish using a CRISPR–Cas system. Nat Biotechnol. 2013;31(3):227–229. Jonnalagadda VS, Matsuguchi T, Engelward BP. Interstrand crosslink–induced homologous recombination carries an increased risk of deletions and insertions. DNA Repair (Amst). 2005;4(5):594–605. Shan Q, Wang Y, Li J, et al. Targeted genome modification of crop plants using a CRISPR–Cas system. Nat Biotechnol. 2013;31(8):686–688. Xie K, Yang Y. RNA–guided genome editing in plants using a CRISPR–Cas system. Mol Plant. 2013;6(6):1975–1983. Yang D, Xu J, Zhu T, et al. Effective gene targeting in rabbits using RNA–guided Cas9 nucleases. J Mol Cell Biol. 2014;6(1):97–99. Hai T, Teng F, Guo R, et al. One–step generation of knockout pigs by zygote injection of CRISPR/Cas system. Cell Res. 2014;24(3):372–375. Li W, Li X, Li T, et al. Genetic modification and screening in rat using haploid embryonic stem cells. Cell Stem Cell. 2014;14(3):404–414. Yang H, Wang H, Shivalila CS, et al. One–step generation of mice carrying reporter and conditional alleles by CRISPR/Cas–mediated genome engineering. Cell. 2013;154(6):1370–1379. Li W, Teng F, Li T, et al. Simultaneous generation and germline transmission of multiple gene mutations in rat using CRISPR–Cas systems. Nat Biotechnol. 2013;31(8):684–686. Wang T, Wei JJ, Sabatini DM, et al. Genetic screens in human cells using the CRISPR–Cas9 system. Science. 2014;343(6166):80–84. Koike–Yusa H, Li Y, Tan EP, et al. Genome–wide recessive genetic screening in mammalian cells with a lentiviral CRISPR–guide RNA library. Nat Biotechnol. 2014;32(3):267–273. Shalem O, Sanjana NE, Hartenian E, et al. Genome–scale CRISPR–Cas9 knockout screening in human cells. Science. 2014;343(6166):84–87. Zhou Y, Zhu S, Cai C, et al. High–throughput screening of a CRISPR/Cas9 library for functional genomics in human cells. Nature. 2014;509(7501):487–491. Fu Y, Foden JA, Khayter C, et al. High–frequency off–target mutagenesis induced by CRISPR–Cas nucleases in human cells. Nat Biotechnol. 2013;31(9):822–826. Shen B, Zhang W, Zhang J, et al. Efficient genome modification by CRISPR–Cas9 nickase with minimal off–target effects. Nat Methods. 2014;11(4):399–402. Hruscha A, Krawitz P, Rechenberg A, et al. Efficient CRISPR/Cas9 genome editing with low off–target effects in zebrafish. Development. 2013;140(24):4982–4987. Cho SW, Kim S, Kim Y, et al. Analysis of off–target effects of CRISPR/Cas–derived RNA–guided endonucleases and nickases. Genome Res. 2014;24(1):132–141. Semenova E, Jore MM, Datsenko KA, et al. Interference by clustered regularly interspaced short palindromic repeat (CRISPR) RNA is governed by a seed sequence. Proc Natl Acad Sci U S A. 2011;108(25):10098–10103. Wiedenheft B, Van Duijn E, Bultema JB, et al. RNA–guided complex from a bacterial immune system enhances target recognition through seed sequence interactions. Proc Natl Acad Sci U S A. 2011;108(25):10092–10097. Hsu PD, Scott DA, Weinstein JA, et al. DNA targeting specificity of RNA–guided Cas9 nucleases. Nat Biotechnol. 2013;31(9):827–832. Ran FA, Hsu PD, Lin CY, et al. Double nicking by RNA–guided CRISPR Cas9 for enhanced genome editing specificity. Cell. 2013;154(6):1380–1389. Mali P, Aach J, Stranges PB, et al. CAS9 transcriptional activators for target specificity screening and paired nickases for cooperative genome engineering. Nat Biotechnol. 2013;31(9):833–839. Fu Y, Sander JD, Reyon D, et al. Improving CRISPR–Cas nuclease specificity using truncated guide RNAs. Nat Biotechnol. 2014;32(3):279–284. Guilinger JP, Thompson DB, Liu DR. Fusion of catalytically inactive Cas9 to FokI nuclease improves the specificity of genome modification. Nat Biotechnol. 2014;32(6):577–582. Gasiunas G, Barrangou R, Horvath P, et al. Cas9–crRNA ribonucleoprotein complex mediates specific DNA cleavage for adaptive immunity in bacteria. Proc Natl Acad Sci U S A. 2012;109(39):E2579–2586. Maeder ML, Linder SJ, Cascio VM, et al. CRISPR RNA–guided activation of endogenous human genes. Nat Methods. 2013;10(10):977–979. Perez–Pinera P, Kocak DD, Vockley CM, t al. RNA–guided gene activation by CRISPR–Cas9–based transcription factors. Nat Methods. 2013;10(10):973–976. Konermann S, Brigham MD, Trevino AE, et al. Optical control of mammalian endogenous transcription and epigenetic states. Nature. 2013;500(7463):472–476. Cheng AW, Wang H, Yang H, et al. Multiplexed activation of endogenous genes by CRISPR–on an RNA–guided transcriptional activator system. Cell Res. 2013;23(10):1163–1171. Gilbert LA, Larson MH, Morsut L, et al. CRISPR–mediated modular RNA–guided regulation of transcription in eukaryotes. Cell. 2013;154(2):442–451. Larson MH, Gilbert LA, Wang X, et al. CRISPR interference (CRISPRi) for sequence–specific control of gene expression. Nat Protoc. 2013;8(11):2180–2196. Mendenhall EM, Williamson KE, Reyon D, et al. Locus–specific editing of histone modifications at endogenous enhancers. Nat Biotechnol. 2013;31(12):1133–1136. Maeder ML, Angstman JF, Richardson ME, et al. Targeted DNA demethylation and activation of endogenous genes using programmable TALE–TET1 fusion proteins. Nat Biotechnol. 2013;31(12):1137–1142. Chen B, Gilbert LA, Cimini BA, et al. Dynamic imaging of genomic loci in living human cells by an optimized CRISPR/Cas system. Cell. 2013;155(7):1479–1491. Wu Y, Liang D, Wang Y, et al. Correction of a genetic disease in mouse via use of CRISPR–Cas9. Cell Stem Cell. 2013;13(6):659–662. Schwank G, Koo BK, Sasselli V, et al. Functional repair of CFTR by CRISPR/Cas9 in intestinal stem cell organoids of cystic fibrosis patients. Cell Stem Cell. 2013;13(6):653–658. Xue H, Wu J, Li S, et al. Genetic Modification in Human Pluripotent Stem Cells by Homologous Recombination and CRISPR/Cas9 System. Methods Mol Biol. 2016;1307:173–190. Yang L, Guell M, Byrne S, et al. Optimization of scarless human stem cell genome editing. Nucleic Acids Res. 2013;41(19):9049–9061. Horii T, Tamura D, Morita S, et al. Generation of an ICF syndrome model by efficient genome editing of human induced pluripotent stem cells using the CRISPR system. Int J Mol Sci. 2014;14(10):19774–19781. Horii T, Morita S, Kimura M, et al. Genome engineering of mammalian haploid embryonic stem cells using the Cas9/RNA system. Peer J. 2013;1:e230. Takahashi K, Tanabe K, Ohnuki M, et al. Induction of pluripotent stem cells from adult human fibroblasts by defined factors. Cell. 2007;131(5):861–872. Yu J, Vodyanik MA, Smuga–Otto K, et al. Induced pluripotent stem cell lines derived from human somatic cells. Science. 2007;318(5858):1917–1920. Takahashi K, Okita K, Nakagawa M, et al. Induction of pluripotent stem cells from fibroblast cultures. Nat Protoc. 2007;2(12):3081–3089. Li W, Shuai L, Wan H, et al. Androgenetic haploid embryonic stem cells produce live transgenic mice. Nature. 2012;490(7420):407–411. Yang H, Shi L, Wang BA, et al. Generation of genetically modified mice by oocyte injection of androgenetic haploid embryonic stem cells. Cell. 2012;149(3):605–617. Esvelt KM, Mali P, Braff JL, et al. Orthogonal Cas9 proteins for RNA–guided gene regulation and editing. Nat Methods. 2013;10(11):1116–1121. ©2014 Wang et al. This is an open access article distributed under the terms of the Creative Commons Attribution License , which permits unrestricted use, distribution, and build upon your work non-commercially.